Drs. 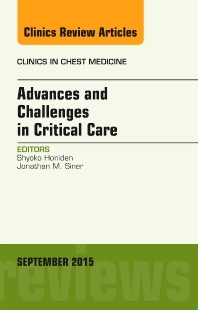 Honiden and Siner have put together a comprehensive issue on Critical Care as it relates to Chest Medicine. Articles include:Recent advances in management of Acute respiratory distress syndrome, Simulation training for critical care, Telemedicine (E-ICU issues), Adverse event reporting/quality improvement in the ICU, ICU Mobility, Hospital-acquired infections/resistant organisms/emerging pathogens, Circadian rhythm disturbance and sleep in the ICU environment, Advances in Sepsis Research, Controversies in ICU nutrition, and more!